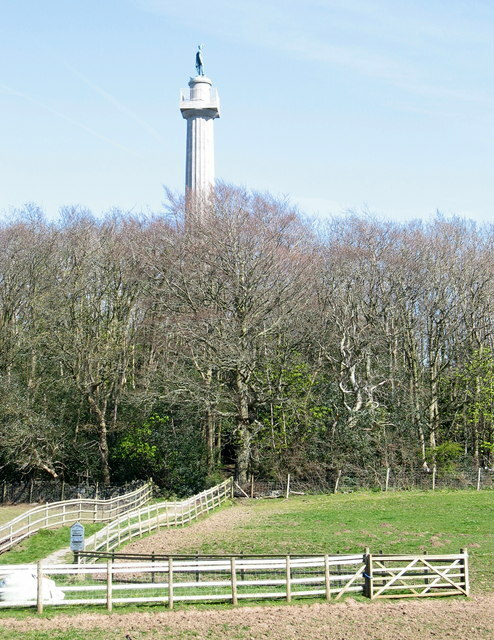 The Marquess of Anglesey's Column stands on a rock which was a hillfort in ancient times. It is located on the outskirts of LlanfairPwll overlooking the Menai Straits and by the Britannia Bridge. 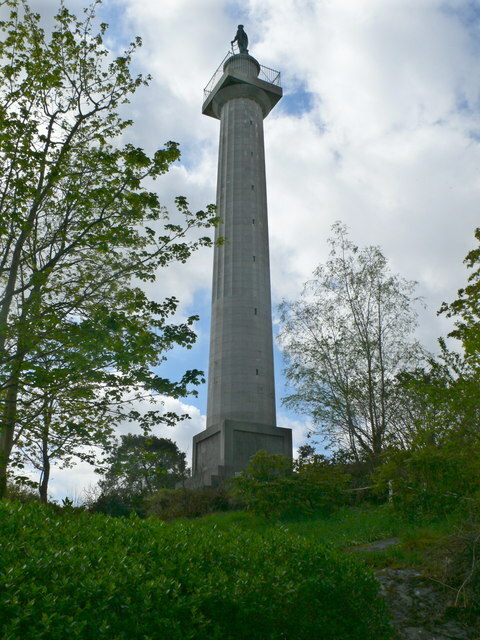 The column commemorates the Battle of Waterloo in 1815, and was built shortly after in 1817, but it was not until 1860 that the bronze statue of the Marquess of Anglesey, who was second in command at the battle of Waterloo, was added and this was after his death. The column was designed by architect Thomas Harrison of Chester, who also designed Holyhead's triumphal arch. It was built from limestone quarried at Moelfre. The bronze statue of the Marquess, added later, is by Matthew Noble. It stands 91 feet (28 metres) high on top of a hill surrounded by bluebell woods. It is open to the public all year round and you can climb up the 115 wooden steps to the top onto the viewing platform, where there are spectacular views of Snowdonia and the beautiful Anglesey countryside. WHO WAS THE FIRST MARQUESS OF ANGLESEY? Prior to being raised to the title of the Marquess of Anglesey, Henry William Paget (1768-1854) was Lord Paget, the eldest son of Henry Paget, the First Earl of Uxbridge. He was a military leader and politician being the Master-General of the Ordnance, twice, a Privy Councillor, and Lord Lieutenant of Ireland twice. As a cavalry commander and second in command under the Duke of Wellington at Waterloo, he led a heroic charge from the centre of the British and Allied forces, which severely restricted the mobility of the French. One of the final volleys of the Battle of Waterloo severely wounded Lord Paget in the leg, that it had to be amputated to save his life. For his role in the battle and for his courage Lord Paget was created the First Marquess of Anglesey by the Prince Regent, just two weeks after the battle. The Marquess of Anglesey was fitted with an artificial leg by James Potts, and lived to 85 years of age. After the Battle of Waterloo he returned to his country seat at Plas Newydd, on Anglesey, where he died in 1854. It is still the family home today, although now owned by the National Trust. The statue of the Marquess was put on top of the column after his death in 1860 to commemorate his life and service to his country. From the car park, at the foot of the column, you follow the path through the woods until you come to a cottage at the foot of the rock where the column stands, here you can pay a small fee, £1.50, to climb to the top. Getting there: Over Britannia Bridge take the first left feed off road on to the A5. Keep left and after about 200 metres take right into car park, which is quite bumpy. You will see the monument sticking out above the surrounding trees. From the car park take the path up through the woods and you'll arrive at the cottage at the base of the column. Access: To the top is via a wooden narrow circular staircase with 115 narrow wooden steps. At the top there is a small wooden door to go through onto the stone platform which has cast iron railings around.